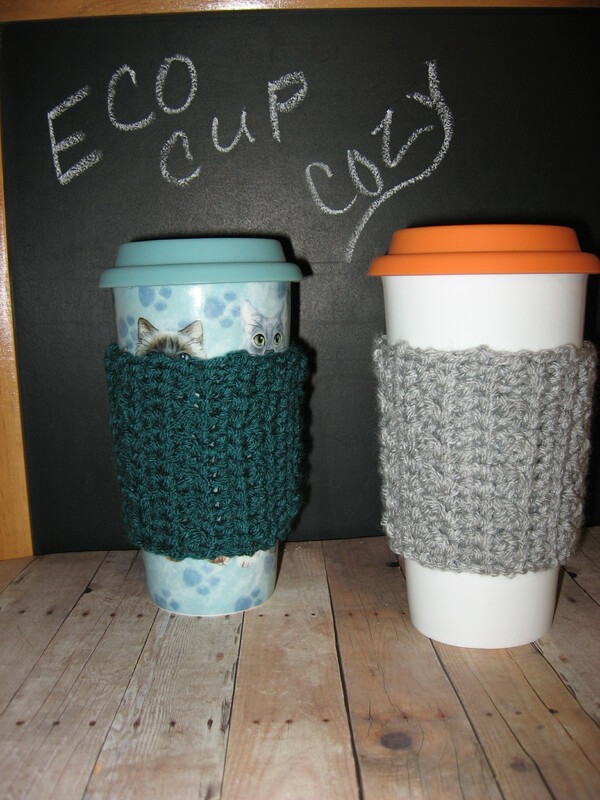 I was experimenting with some crochet stitches the other day and the result was my new Eco Cup Cozy design. I’m offering this as a free pattern for all to enjoy. These work up so fast that they make a great last-minute home-made gift. Add your own embellishment like a (heart or a sweet little note to your Valentine and you have February 14th covered! PATTERN NOTES – Cozy will stretch to fit a variety of cups. If a larger cozy is needed, simply do an additional pattern repeat as indicated. Row 2: Chain 1, sc in first sc and in each sc across, turn. Row 3: Chain 1, sc in first sc and in each sc across, turn. Row 4: Chain 1, skip first sc, *dc in next sc, slip stitch in next sc; repeat from * across, ending with sl st in last sc, turn. Row 5: Chain 1, sc each each sl st and each dc across, turn. Row 6-7: Chain 1, sc in first sc and in each sc across, turn. Row 8: Chain 1, skip first sc, *dc in next sc, sl st in next sc; repeat from * across, ending with sl st in last sc, turn. Repeat rows 5-8 six more times. Fasten off. For larger cups, do an additional repeat. FINISHING: Fold piece in half, right side facing, bringing first row to meet last row. Sew ends together. Fasten off. Turn right side out. Using yarn needle, weave in all ends. Original design. All rights reserved by original designer. This entry was posted in Crochet, Uncategorized and tagged crochet, cup cozy, eco cup, free crochet pattern. That’s a good idea! I want to teach myself to crochet, & this would be a great way to practice some stitches. Hello! I am a knit/crochet instructor looking for new teaching patterns. Would you mind if I used this cute pattern for teaching? I will understand if you prefer I don’t. Thanks! No problem at all. Thank you for asking!